This remodel project went from an Old world flair with dark tones to an elegant modern flair accenting all the lighter tones which have been the top trends for 2016. 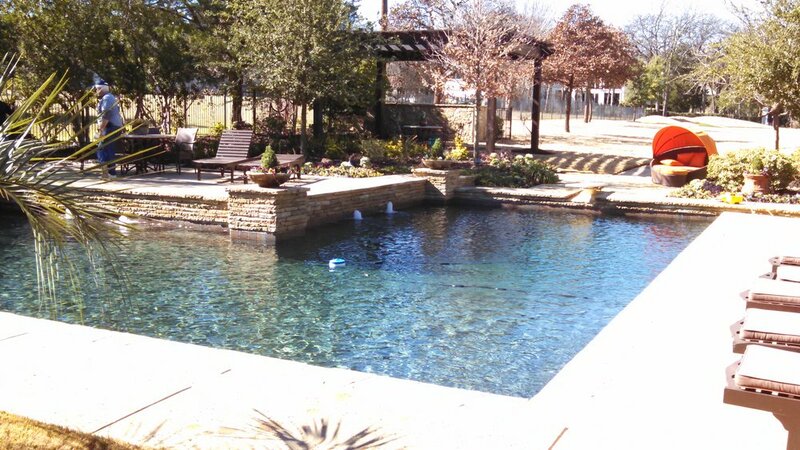 The project was originally constructed with Oklahoma flagstone, salt deck and Ocean Blue pebble sheen and was converted to Ivory travertine coping and paver decking, Cool blue pebble sheen and a splash of blue glass tile at the waterline to brighten this amazing backyard up. We added length to the pool to give the clients truly more room to dive and a larger shallow area for volleyball and basketball. To accentuate the raised beam wall and add some white noise to the project we added three spill edges along with several gushers to the tanning ledge. A custom glass tile bar, lounging bed and fire pit area were incorporated into the new design to create another living space for the clients and opens up the yard for entertaining purposes.